Former Cathedral Prep and Esmark Stars goaltender Jake Kucharski was selected by the Carolina Hurricanes in the seventh round of the 2018 NHL Draft on Saturday. 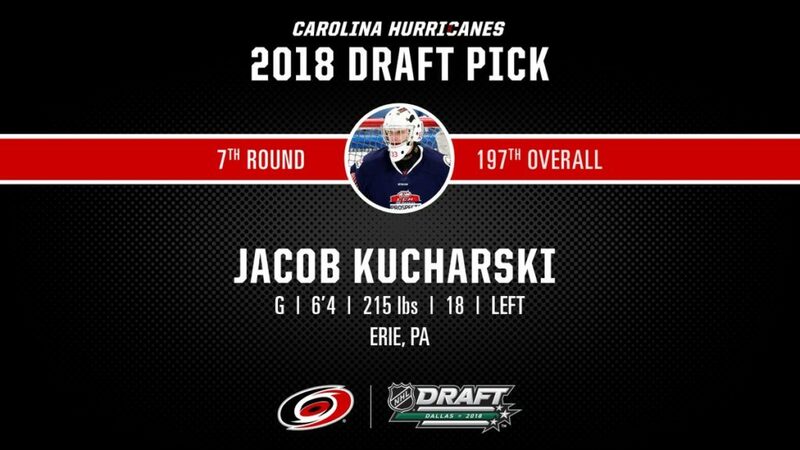 Kucharski, an Erie, Pa., native, was taken with the 197th overall by the Hurricanes and was the 24th goaltender selected in the draft, which includes the top 18-year-olds from around the world. The 6-foot-4, 216-pound netminder spent last season with the Des Moines Buccaneers in the USHL, where Kucharski split time in goal, starting 26 games while posting an .881 save percentage and a 3.56 goals-against average. He spent the 2016-17 season with the NAHL’s Austin Bruins, where he had an .894 save percentage in 34 games. During the 2015-16 season, Kucharski split time between the Ramblers in the PIHL and the Esmark Stars’ under-16 squad in the NAPHL. With Cathedral Prep, he had a .290 save percentage in nine game for the Penguins Cup-winning Ramblers. He had a .917 save percentage in 14 games with the Stars. Kucharski will play one more season in the USHL before matriculating to Providence College for the 2019-20 season. The Hurricanes will hold his NHL rights until after his career with the Friars is over.